I took the day off of work today to clear my head after a particularly bad day, so I met up with two other hikers to hike up Owl’s Head. I’d never been there before so I had no idea what lay ahead. Our plan was to take the Lincoln Woods Trail to Black Pond, bushwhack to the Lincoln Brook Trail, connect to the Owl’s Head Path and then return. 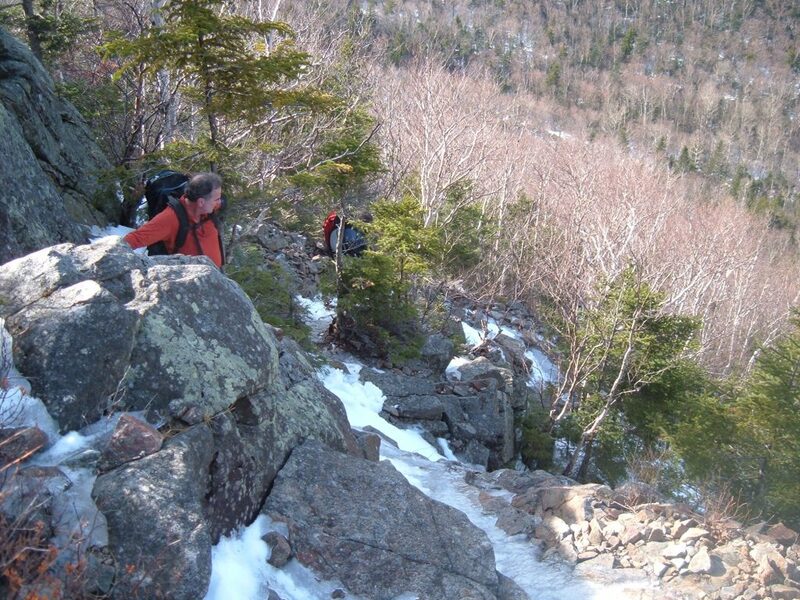 The walk to Black Pond was quick and straightforward, then we followed the broken-out, snowy bushwhack to Lincoln Brook Trail. The trail rose very gently. Before we knew it, we reached the slide heading up Owl’s Head. It was sunny, clear and relatively warm for a January day. But the trail was snowy, so we put snowshoes on for the steep, one mile climb up to the summit. As we climbed it became clear that this would not be a straightforward ascent. The trail was at points snowy, icy, and bare rock. I carefully picked a way up to the false summit with the others behind me. There, we dropped our packs. Suddenly all the footprints disappeared so we put in fresh tracks to the top of Owl’s Head. The trip down the slide was much more harrowing than the trip up. The sun had melted and softened the snow, making it nearly impossible to get any traction (even with snowshoes). I felt most comfortable going down backwards while my partners came down sideways. We all stuck close to the trees so there was something to grab onto. The afternoon was quickly winding down and we still had to hike the 8 or so miles out of the woods. We knew we’d need to finish by headlamp but we tried to walk as fast we we could. When we reached the start of the bushwhack back to Black Pond, the group decided to stay on trail rather than follow our old tracks. We continued along the Lincoln Brook Trail by headlamp. I could feel myself getting tired. This is where things got confusing. We had one particularly hairy river crossing where we all got our boots somewhat wet. We took quite some time scouting a way across, which, ironically, ended up to be pretty much right where we first encountered the river. I had been following along in the back of the pack for much of the return trip, oblivious to which trail we were on and how far we had gone. Eventually we got to an area littered with blowdown. My hiking partners argued about a trail relocation that we’d likely missed. The lead hiker had been following snowshoe tracks rather than blazes up to this point, so who knows if we were on trail or not. After much deliberation we turned around to look for the trail relocation. No such luck. We turned back again. And again. The two of them kept arguing about what to do and where to go. I had nothing to contribute so I kept quiet. They were the experts, not me. 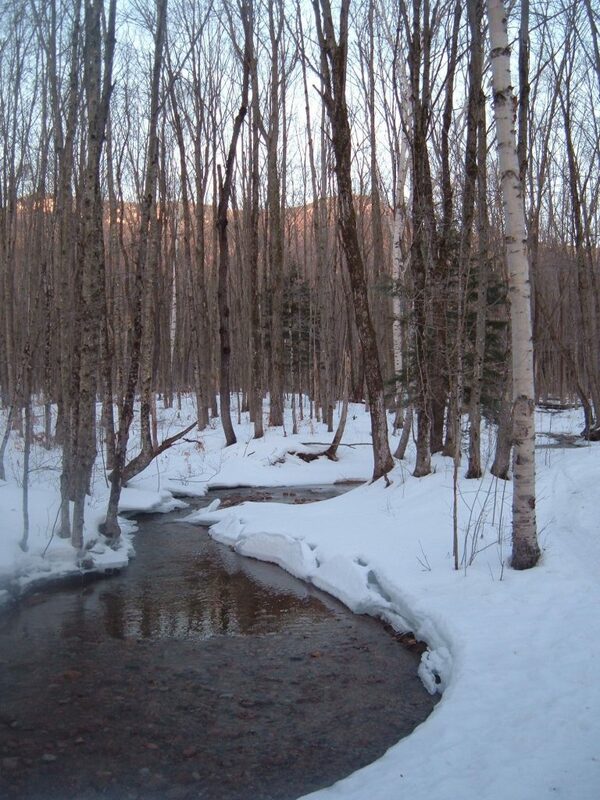 We trudged through the downed trees and arrived at another stream crossing near a beaver bog. After crossing the stream, we couldn’t find anymore tracks. One of my partners had whacked his head on a log and was bleeding all over the place. Now my two companions were really starting to lose it. I remember thinking how pretty the area was. There were great expanses of open space surrounded by thick evergreens. The full moon shone brightly, lighting up the snow. When D wiped his bleeding head injury, he spattered the blanket of snow with red. A tight balaclava eventually stopped the blood flow. Meanwhile, my other hiking partner kept taking out the map and cussing about how he’s never gotten lost. He didn’t understand how we could have lost the trail. The whole scene was surreal. I tried to listen to their screaming and extract pertinent information that might get us out of this mess. The bog was covered with snow and ice of questionable thickness. It seemed like a dangerous place to wander around on. D tried to lead us back to a trail, but he fell through the ice and got soaked up to his chest. It took him a minute to haul himself back out. It was dark. We were lost, cold, and wet. Things were not looking good. I felt helpless. It seemed that the one thing they could both agree on is that if we headed south, we’d run across the trail. I did not want to backtrack anymore. I liked the idea of heading south. But D insisted that we’d have to cross the bog to go south. I pulled out my compass while they were yakking about it. Well, shoot. That’s not south, that’s north. South goes through the trees, away from the bog. I felt compelled to speak up. I’d had enough drama for one day. I spoke with confidence, that we’d have to walk along the forest to go south. And I showed them my compass to prove it. Not 5 minutes after we started walking south we came across an old road, which led to the relocated trail. SUCCESS! We all felt a huge weight lifted from our shoulders and got a boost of energy. We walked hurriedly along this glorious trail. Getting lost at night with two experienced hikers was not a fun experience. I was surprised at how I was able to remain calm and take control of a rapidly deteriorating situation. I didn’t know I had that in me. Comically, my two companions totally downplayed our predicament for the remainder of the hike! But now we were making progress, making jokes and walking together. I felt like now I was more a part of the team and that I had something to contribute. I had chosen our route up the slide and helped us rationally think our way back to the route near the beaver bog. I should really be more confident in my skills. Once we reached the Lincoln Woods Trail, we knew we were almost back. We kept chatting to keep the time passing quickly. We turned off our headlamps and walked out under the moonlight. About a mile from the trailhead I started feeling very fatigued. At 9 pm we finally reached the car, packed up our gear and hit the road. At a gas stop on the drive back, I headed inside to grab a snack. As soon as I stepped out of the car, I slipped on the ice and fell flat on the ground. Neither of my companions saw me, but I was laughing. After 20 miles of walking in difficult terrain, it is here that I slip and fall. Of course. 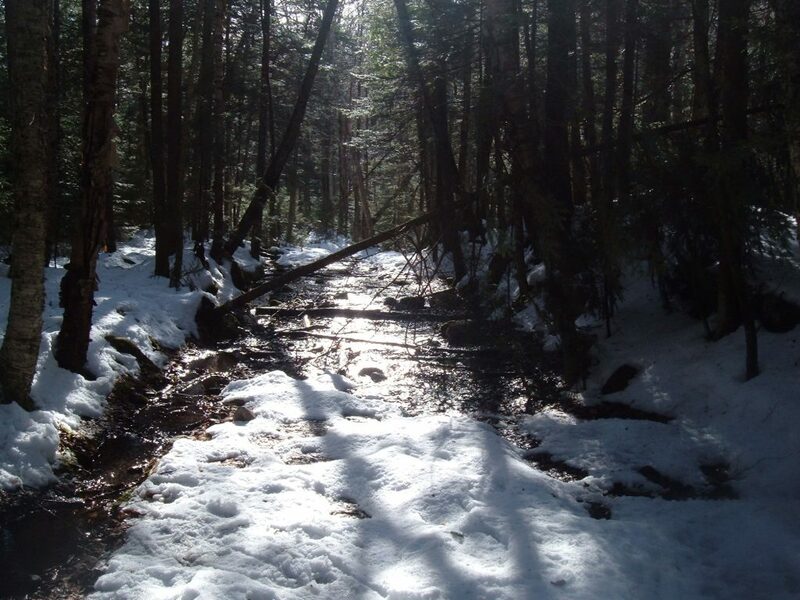 This entry was posted in Hiking, New England and tagged hike366 on January 14, 2006 by Jess B.